NETWORK FINALS: Both SHARK TANK and 20/20 increased 0.1 in final numbers, but SLEEPY HOLLOW lost a precious 0.1, pushing it closer to the edge of the bubble. CABLE HIGHLIGHTS: Discovery’s full primetime schedule hit the Top 10, led by the night’s #1 show GOLD RUSH, up 0.13 from last week to 1.26; lead-out DEADLIEST JOB INTERVIEW held at 0.47, and lead-in GOLD RUSH: THE DIRT was at 0.44. Spike’s BELLATOR MMA LIVE was at 0.97, with lead-out UNRIVALED at 0.43 and lead-in KIMBO SLICE: THE TRUTH at 0.39. 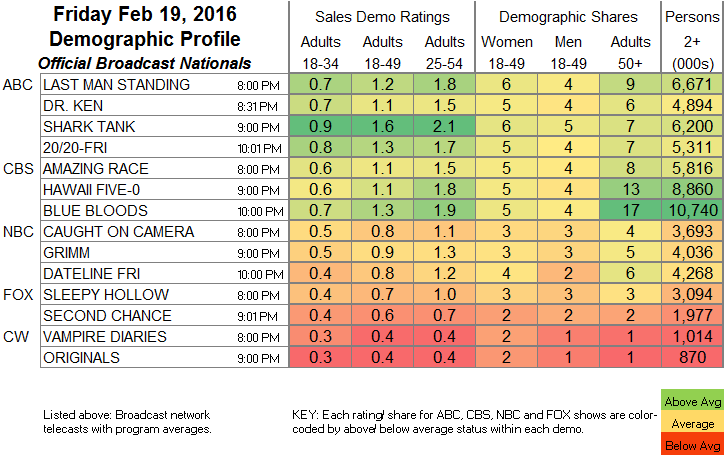 On Lifetime, THE RAP GAME jumped 0.18 to 0.68, and BRING IT was up 0.05 to 0.60. A 9AM episode of Disney’s MICKEY MOUSE CLUBHOUSE cracked the Top 10 at 0.52, with lead-out LION GUARD down 0.08 to 0.43. ESPN’s NBA doubleheader was led by 0.52 for the Indiana vs. Oklahoma City game, with 0.46 for Boston vs. Utah. Adult Swim’s CHILDRENS HOSPITAL was steady at 0.51. On Food Network, GUY & HUNTER’S EUROPEAN VACATION was up 0.07 to 0.32, BURGERS BREW & QUE was up 0.04 to 0.26, and AMERICAN DINER REVIVAL was down 0.06 to 0.19. We’s MARRIAGE BOOT CAMP fell 0.05 to 0.29. 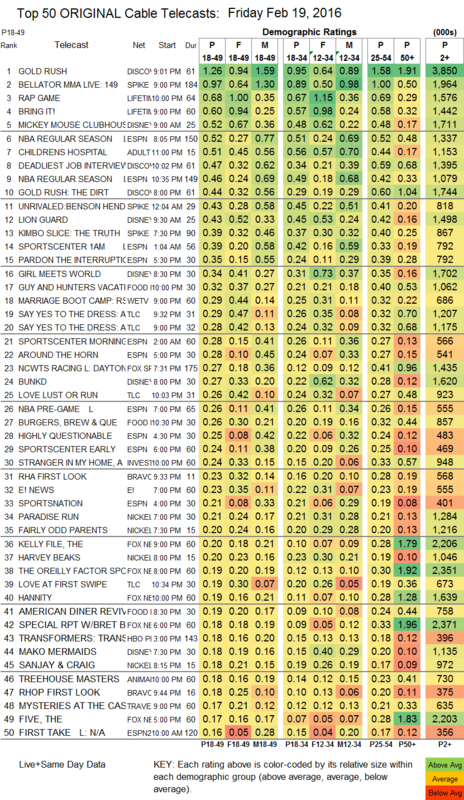 TLC’s SAY YES TO THE DRESS was at 0.29/0.28 compared to last week’s 0.25 for 1 episode, with lead-outs LOVE LUST OR RUN up 0.03 to 0.26 and LOVE AT FIRST SWIPE steady at 0.19. Bravo’s THE PEOPLE’S COUCH ticked up to 0.15. On History, AMERICAN RESTORATION and MILLION DOLLAR GENIUS were at 0.14/0.13. HBO’s VICE dropped 0.08 to 0.12, and ANIMALS held at 0.08.